Sometimes, there may be cases where you want to access your home’s available equity without needing everyone on the property title to sign for it. Perhaps you and your spouse maintain separate finances, or your parents are on the title. Or there could be another reason you would like to leverage your home equity without having to speak with the other owners. Unfortunately, most of the time accessing home equity through mortgage refinancing requires everyone on title to sign. But there’s another option: a home equity loan. Home equity loans are based on a person’s equity, but don’t actually involve registering on title. To qualify, you must prove your home’s value and registered encumbrances to validate the equity. 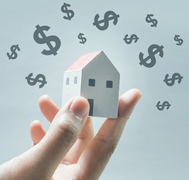 Most home equity loans require you to have 50% equity to the value in your home. Getting a mortgage — whether it’s a first mortgage or a second mortgage — involves closing costs such as appraisals, legal fees, mortgage broker frees, etc., and can take up to two weeks to close. But a home equity loan requires no mortgage registration, so there are no legal fees and deals can be funded within a couple of days. At Prudent Financial, for example, our home equity personal loans can be opened on the same day and with payments that fit into your budget. We offer home equity personal loans for up to $15,000. Our loans have fixed interest rates that will not fluctuate, so you can plan out your repayment schedule well in advance. This can be a great option if you need to consolidate debt, make a home renovation, purchase a vehicle, pay for tuition, or have a big event, like a wedding, coming up. A home equity personal loan is NOT a secured loan or a second mortgage. It’s simply a loan that you can qualify for based on past responsible money habits and by being a homeowner. Find out if you are eligible for a Prudent Financial Services home equity personal loan today. Call Marie, our Prudent Home Loan Specialist, at 416-223-9300, ext. 231, or visit www.prudentfinancial.net.